Film Friday: Street Fighter (1994) - A Swan Song For Raul Julia — GamingWithSwag.com - Dads By Day, Gamers By Night. Though Super Mario and Sonic the Hedgehog ruled at-home gaming in the early 90’s, Street Fighter II ruled the Arcade machines and, arguably, gaming culture in general. I’ve already written about the game’s cultural impact, and I could write even more if I felt led. Even now, 25 years later, Nintendo released yet another incarnation of Street Fighter II for their Switch console and hype built around it for months. Of course, nothing now could compare to the game’s notoriety in its true heyday. In the early 90’s, this game was everywhere, in arcades coast-to-coast and on the minds of gamers of all ages. The characters were more than animated warriors, they were points of self-identification. Choosing to play as Ken meant something. So did being Zangeif. These characters were more than digital sprites, they were hallowed figures of underground lore; warriors who held the secrets of ancient arts and the Hundred-hand slap. It’s no surprise that the game would catch Hollywood’s attention, and it’s less surprising that a major Studio (Universal), would choose to make a full-blown motion picture adaptation of this cultural phenomenon. What is surprising is just how they would so completely misunderstand the game’s appeal and instead create, well, something else. 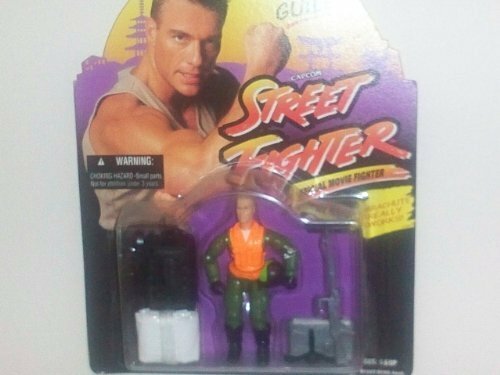 Street Fighter stars 90’s a-list movie star Jean Claude Van-Damme as Colonel Guile, an inspiring and well known military figure with the Allied Nations whose mission is keep order in the war-torn region of Shadaloo, a broken land ruled by a power-mad tyrant known as Bison, an eccentric military genius who wants to create the perfect genetic soldier and unite the world “under the loving grip of the Pax Bisonica” (his words, not mine). Oh, and there’s a ton of shoehorned side characters and subplots that involve multiple other characters from the game. Now, something probably sounds amiss. You may be saying, “wait, in the game, Colonel Guile is clearly American, and he’s a USAF pilot who flies jets.” You are correct, but that’s how adaptation works: You begin with an American Jet pilot and end with a Faux-UN European who drives a stealth boat. Or maybe that’s not how it’s supposed to work. And if you think that’s far too much creative license on the part of the studio, it’s only the beginning. Ken and Ryu are small-time hustlers, Chun-Li is a news reporter, Dhalsim is a geneticist, and Fei Long—not even mentioned despite their including some “original” characters like the beloved Captain Sawada. If you love the world of Street Fighter II: The World Warriors, then this movie will probably make you furious, or at least confused. Or both. The film tosses the whole concept of the game out of the ring in favor of, well, Saturday matinee nonsense that no one could really take seriously. If you want to know what drove these decisions, the Audio Commentary on the DVD is particularly enlightening (if you can bear it). I LOVE this movie. It’s arguably one of my top 5 Guilty Pleasures. I cannot help myself. I enjoy it every time I watch it. Even when I expect to hate it. I don’t. I enjoy it. I can identify only one reason for this: this movie is basically how playing with action figures works, and I LOVE action figures. Basic scenario: You pick good guys; you pick bad guys. Nonsense ensues. They fight. They meet each other. There’s betrayal; there’s camaraderie; there’s violence, mayhem, and bad jokes. And it’s a blast. BUT it’s also a mess. That pretty much sums up my experience watching this movie; it’s like watching an 8 year old play with G.I. Joes. In that way, it’s kind of wonderful (agin, for me…and no one else). Now you must be saying, “That’s how you played with your action figures; you must have sucked as a kid. And an adult. And a human.” And you’d be kinda right, but the fact remains: Street Fighter hit me at just the right time of life, when I could watch it and think, “Wow, this is exactly how I tell stories. I wonder if those two characters will fight! Wow, they are fighting just like I expected, and there’s a stealth boat! This movie is amazing.” Yeah, it worked. In its own strange way, it was amazing. For me. Sorry to everyone whose respect I garnered via my TRON and Mario pieces. I know this admission comes as a blow…I will try to make up for it soon. I cannot with integrity recommend any adult person watch this movie. EVER. I sincerely believe any adult whose name is not C.J. Stunkard will hate this movie and may even like the Street Fighter mythos LESS as a result of having watched. Yes, it’s that egregious, folks. For me, it’s a childish treasure and immense delight….but I have never met anyone that agrees with me. Yes!!!! Huh? Yes. I think that kids age 7-10 might actually enjoy this. I saw it at 13, but I was pretty sheltered, so I will skew younger. Honestly, the film has a certain Saturday matinee “Bad movie that’s still fun” quality that could connect with the right youngster, maybe. Just like Phantom Menace or badly dubbed Kung-Fu. Street Fighter could work for the right youngster…but likely not. I like this movie, but not because it is a good film. Not because I love Street Fighter. But because you just can't look away. It's like a trainwreck in so many ways, but no one was hurt so it's still okay to watch. The dialogue is incredibly bad, and most of the plot makes no sense. But it's hilarious. The characters that actually have something to do with the plot are embellished to the point where they become caricatures of themselves. There is one person that shines though. Despite the crappy script, Raul Julia gives an incredible performance given what he has to work with. I cannot imagine anyone else playing M. Bison in this role. You can see and feel the passion he has for acting in his commanding role as the evil Shadaloo leader. 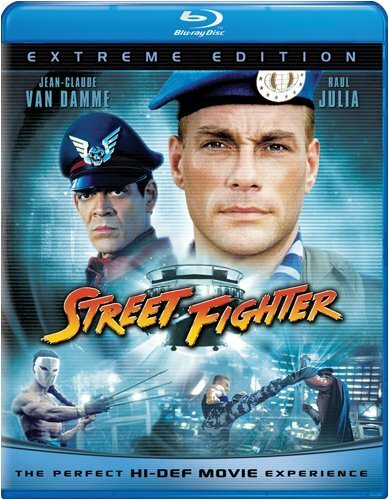 Unfortunately, Julia would never live to see the release of the Street Fighter film as he passed away a few months earlier. The other main issue I have with this movie is the fights. I feel like less than a year later the Mortal Kombat film that was released did a way better job conveying the one-on-one fighting that was iconic to both series. Overall, Street Fighter is in no way as bad as the Super Mario Bros. film. However, if I were going to pick to watch a Street Fighter flick, it would definitely be the Street Fighter Animated Movie. Overall, Julia saves the live action version, which would spawn a spin-off video game of its own. The Street Fighter Movie video game released on Sega Saturn and Sony PlayStation.